The Grant Room was originally known as the Sheridan Grille which operated as a member dining room and pool room until 1981, when the pool tables were sold and the room became a luncheon buffet. Then in 1998 the administrative offices were all relocated to that space when it was decided to renovate the overnight rooms for the creation of the Inn at the League. With the demand for private dining space growing, the Sheridan Grille was deemed the perfect location for these events. 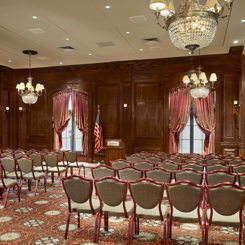 In 2006, the offices were moved to the lower level and the Sheridan Grille was completely renovated and redesigned to become what it is today, the Grant Room. The Grant Room is our newest private dining space with the capability to hold one large function of 150+ guests or to subdivide into three break out rooms.